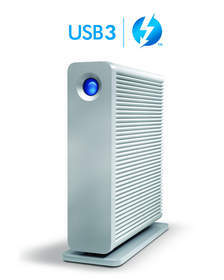 PARIS -- (Marketwire) -- 12/04/12 -- Today LaCie announced its best-selling hard drive, the d2, now features USB 3.0 and Thunderbolt connectivity together with the latest 4TB 7200rpm hard drives. The LaCie d2 USB 3.0 Thunderbolt Series enables professionals to complete their work faster with ample capacity for large files sizes. Plus, with universal connectivity projects are never derailed by incompatibility. "The LaCie d2 has been trusted by creative professionals for almost a decade," said Erwan Girard, Business Unit Manager, LaCie. "We've leveraged industry leading technology and supercharged the LaCie d2, so our customers can stick with their favorite hard drive while improving efficiency." The LaCie d2 offers seamless cross-platform compatibility in any work environment. With USB 3.0 and Thunderbolt interfaces, the LaCie d2 is an excellent option for new Mac or Ultrabook users. Backward compatibility with USB 2.0 means the user can connect the product to any standard computer. Both USB 3.0 and Thunderbolt cables are included. The LaCie d2, design by Neil Poulton, is available with a full back up software suite in 3TB and 4TB capacities through the LaCie Online Store and LaCie Resellers starting at $299.00. For more product information, visit www.lacie.com. With operations in the Americas, Europe and Asia, LaCie is a leading manufacturer of storage devices for Apple®, PC and Linux. LaCie has differentiated itself through sleek design and remarkable technical performance. Find out more about our products at www.lacie.com.